Who knew the word ”of” could get people so worked up? 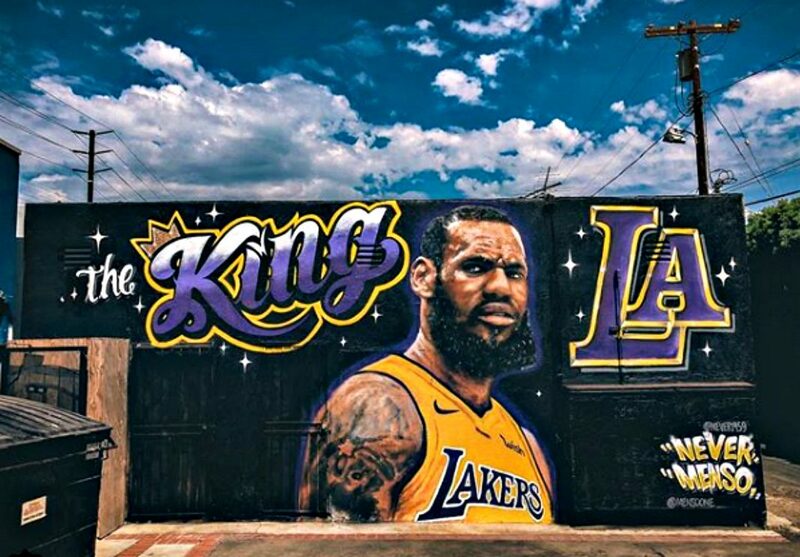 On Friday, local artists Jonas Never and Menso One unveiled their newest work: a LeBron James mural in Venice, celebrating the recent announcement that he will be joining the Lakers basketball team. But unlike most of Never’s pieces, which often depict public figures in the news–he’s the man behind the recent tribute murals of Anthony Bourdain and Chester Bennington that have been spotted around L.A.–this one had some immediate backlash. Within hours of the artists posting a photo of the mural online, the painting had a bounty out for its destruction. As Sports Illustrated reports, Twitter user @BenOsanze who went by “Lakers Fanbase” on a now-deactivated account, announced a $300 reward for anyone who would go to the Baby Blues BBQ in Venice, vandalize the painting, and make a video of it. At about 1 a.m. on Sunday morning, according to the restaurant’s security footage, it seems someone took him up on the offer. James’s face was scrawled over in yellow paint, along with the messages “We don’t want you,” “LeFraud,” “No King,” and “3-6” (which, Yahoo Sports helpfully notes, is assumed to be a dig at James’s spotty record at the NBA Finals). While that might sound like some people taking a preposition a bit too seriously, the artists ultimately acquiesced. When they went back on Sunday afternoon to restore the mural, they not only covered over the scrawls, they also removed the “offending” of, as Never describes it. He went on to joke in the caption of his Instagram post of the restored mural that some of the graffiti on his mural seemed to be done by someone so tall, that it might just have been Bryant himself. RELATED: The Most Instagram-Worthy Murals in L.A.